Now that you have found the right partner and worked on the first ball (serve and return), it's time to talk about court positioning. 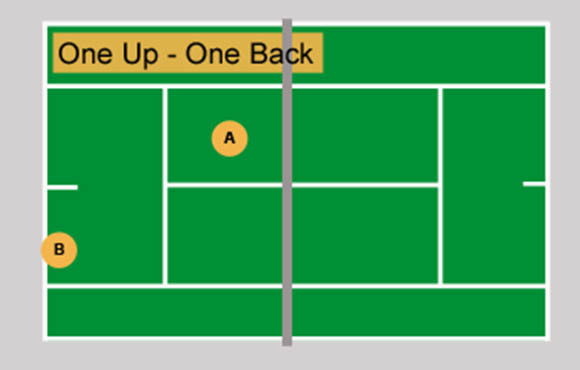 There are three basic court positions for doubles tennis: two up, two back and one up, one back. 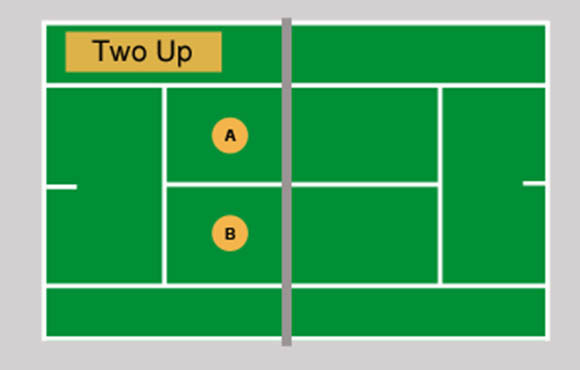 Two up means that both players are positioned at the net. This is the best of the three because you are offensive and can cover most of the court from this configuration. The one wild card is the lob. Because there is nobody there to back you up, covering the lob can be tricky for the weekend warrior. 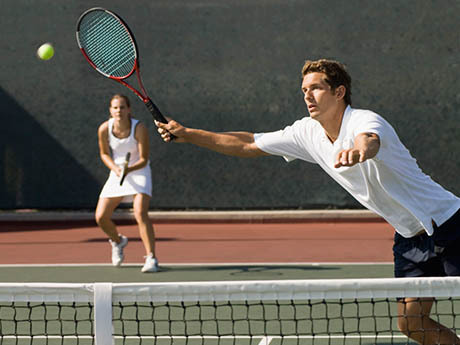 You must learn to recognize the lob earlier by watching the opponent's court position and racket face. For example, if you've come in behind a deep approach shot or hit a deep first volley and you see your opponent back up, odds are you will see a lob. Anticipation is the key to covering the lob effectively. 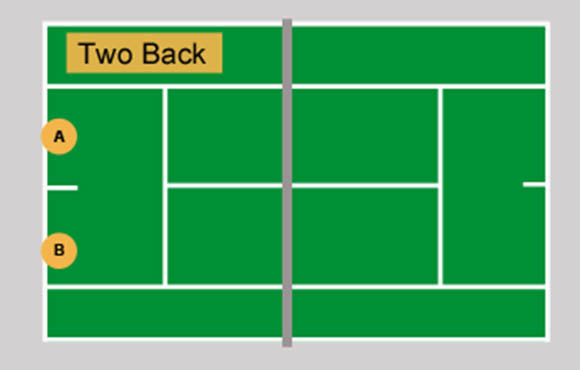 Two back means that both players are positioned on the baseline. Although most of the court is covered and you do not have to worry about the lob, this is not considered as effective as two up because it is difficult to be offensive from the baseline in doubles. This configuration should be used if you are and your partner are not good volleyers, or at times when your opponents are moving a lot at the net and outplaying you from there. Then the best bet is to step back to make it more difficult for them to hit winners and to make sure you don't go home with a bunch of bumps and bruises courtesy of the other team drilling you with the ball. One up, one back means that one player is standing at the net while their teammate is on the baseline. This is the least desirable of the three configurations mainly because there is a big gap left open in the court right down the middle. As long as the ball stays in front of the player at the net, it is not as big a problem. But if the pattern switches and the ball is cross-court from the net player, then you are in trouble. It also makes poaching (the opponents net player crossing the middle of the court to intercept the ball) more effective because there is a big open target to hit to when the opponent gets the ball. Many times you will find yourself caught in a one up, one back situation. Don't panic, it's not the end of the world. But do try to get up to the net with your partner at the earliest opportunity to be more aggressive. If you don't feel comfortable doing this because of the level of your volleys, then work on your volleys until you do feel comfortable. You will also find that the more often you move forward to the net, the easier it will become to see the lob coming before your opponent even makes contact with the ball.